Fans in the Phillipines can start hunting more new movie toys. 2005 Baords member BumblebeeNotOP lets us know that the Transformers: Studio Series Deluxe Wave 6 is out in the Philippines. 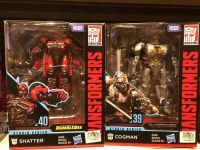 SS-39 Cogman and SS-40 Shatter were found at Toys”R”Us in Uptown Bonifacio Global City. Their wave partner SS-41 Constructicon Scrapmetal should around too. Happy hunting! Keep reporting your sighting around the world in the 2005 Boards! 2005 Boards member Rookbartley is giving us the heads up that the Transformers: Bumblebee Titan Changer Shatter has been found At US Retail. This easy-to-transform Shatter figure transforms into a big jet (not very movie-accurate though). The robot mode and packaging art are based in previous concept art of the character. It sure took her time to finally show up at US retail. Titan Changer Shatter was found at Walmart in Fort Wayne, Indiana for $14.97. 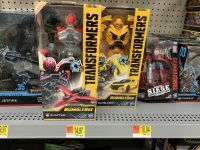 As noted by 2005 Boards member Nevermore, this sighting leaves Titan Changer 1977 Camaro Bumblebee as the only figure of this line still not seen at US retail (same situation as for German retail). Share your sightings news on the 2005 boards! 2005 Boards member transform75 is giving us the heads up of some new Transformers Studio Series Toys in France. 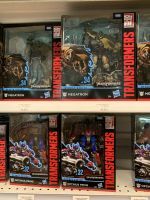 Studio Series Voyager Class Wave 5 SS-32 Optimus Prime (remold of SS-05 Optimus Prime that can combine with Studio Series Jetfire) and Leader Class Wave 2 Dark Of The Moon Megatron have been found at Toys”R”Us in Paris, France. Optimus Prime is priced €34.99 ($39.25) and Megatron is €49.99 ($56.08). Unfortunately, it seems a case of special cases with only these toys, so the respective wave partners Jetfire or Bonecrusher are not available yet. 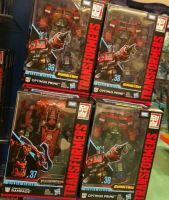 Additionally, the Bumblebee Energon Igniters Speed Class Cliffjumper was spotted in the same store. Autobase Aichi has uploaded some new in-hand images of the new Transformers Studio Series SS-42 Voyager Long Haul for your viewing pleasure. The images come from a YouTube video, and we finally have some clear shots of this new incarnation of the Constructicon from Revenge Of The Fallen. There are several comparison shots next to the original Voyager Long Haul from the 2009. As we can see, the new Studio Series Long Haul is a bit shorter in robot mode, but he is clearly more movie-accurate and proportioned. The Studio Series toy transforms into a completely different dump truck compared to the 2009 toy, but both seem to be about the same size. The images also include a look at Long Haul as Devastator’s leg. 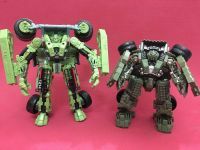 We are sure many fans are really looking forward to collect the rest of the Studio Series Constructicons. Check out all the images after the jump and then sound off on the 2005 Boards! War For Cybertron: Siege Voyager Wave 2 Starscream and Soundwave spotted at Müller in Cologne-Kalk. Studio Series Deluxe Wave 5 SS-26 WWII Bumblebee and SS-28 Barricade were found at Müller store in downtown Dortmund, so their wave partners Clunker Bumblebee, Sideswipe and Crankcase should surface soon. Still no sign of Deluxe Wave 3 or 4. Transformers: Cyberverse Wave 3 Ultra Optimus Prime seen at Müller in Datteln. Happy hunting to all German fans! Via TransFans Facebook we have a great in-hand image of the upcoming Revenge Of The Fallen Constructicon for the Studio Series line: SS-42 Long Haul. The image features the new Voyager SS-42 Long Haul in robot mode next to his “ancestor” the first Voyager Long Haul from the 2009 Revenge Of The Fallen toyline. While the ROTF mold is sure bigger and a great mold back in the day, the new Studio Series is by far more movie-accurate and proportioned. 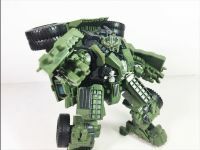 Don’t forget that this new Studio Series mold can also become part of the new Studio Series Devastator! Click on the bar to see the mirrored image and the join to the ongoing discussion on the 2005 Boards!